In case , you are not sure yet, Psychology matters in trading, a lot! After training for over three months, I took a trade today that violated all my trading rules. It was a no brainer. Don’t take that trade or take the opposite trade. I still took the trade. The stock was in a downtrend. You don’t buy against the trend. There was no chance of it being a retracement as It was already near the bottom Bollinger band. MACD was in the red zone. A perfect shorting candidate! % B was in the negative territory. No one buys there, no one! RSI was still not below 30, hence, it was not in an oversold zone. So, according to the system that I use, there was no buy signal at all. Heck, I even hesitated buying it when it was at 1190. 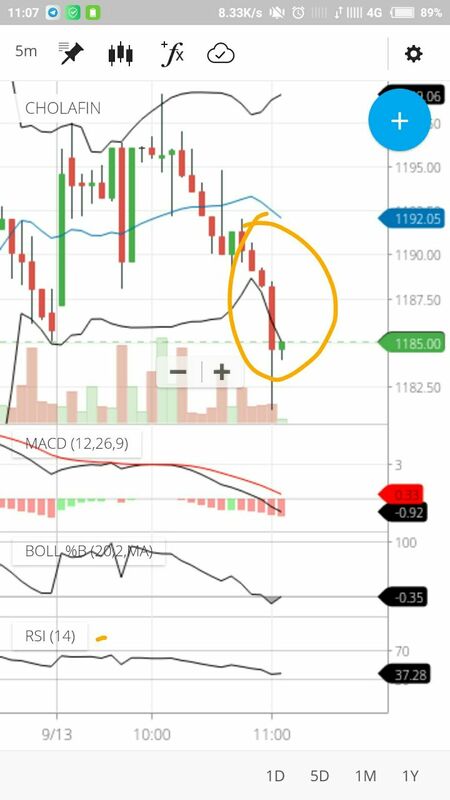 Then, it dropped to 1189. I thought, I am getting a better price, ignoring all the indicators. Greed took over. I rationalized, “That guy is a “Stock Guru”, he must know something that I did not.” And, I bought. That guy admitted he was wrong and updated that I should sell, when the stock was trading at 1188. I hesitated. That would mean a loss of 200. It rebounded to 1188.45. I said to myself, “See, I was right to not sell”. Then on the next candle, the stock fell, forming a huge lower shadow, hitting my stop loss. And I was out of market. Why that guy who gave the call is a “Guru”? He was gracious enough to admit that he was wrong and got out of the market before it was too heavy a loss. I did not trust my own analysis. I did not get out while there was still time to get out with a small loss. I could make my ego take that loss. Trading is a discipline that requires huge mental strength and self belief. It build over time through experience and I hope today’s failure was a huge stepping stone for me! Till next time, keep learning!